Videographer Dave Loveman goes flying in the U.S. Allegro as part of our two-pilot, all-video flight reviews. Watch for this full-length video spring 2012. LSA America builds the Czech-designed Allegro in America as one of the first companies (but not the last, I suspect) to cross the Atlantic. Ironically, this results in an aircraft less expensive than other LSA that come from Eastern European countries where we once thought low wages and high aviation skills would upset U.S. airplane manufacturing. Funny how life works out, and in only six or seven years. *** Doug and Betty Hempstead, who used to import Allegro from Fantasy Air, took a long and winding road to American production finally teaming up with another developer in Roseburg, Oregon. When the other company shut down the Hempsteads had to start all over again. Finally they succeeded in bringing the Allegro to U.S. manufacturing under the company name LSA America. The North Carolina company was visible at Sebring 2012 where I took an opportunity to fly a Made-in-the-USA Allegro. A full-length report will appear in the March 2012 issue of Light Sport and Ultralight Flying magazine (and will be posted here later) but following is my mini-review. |||| Allegro is light on the joystick while being lively in performance with the 80-hp Rotax 912 as its powerplant. Indeed, Hempstead believes the new Allegro gets performance out of 80 horses that other LSA need 100 horses to match. Such comparisons are difficult to evaluate accurately but Allegro is clearly a good performer thanks partly to its low empty weight. *** With very low stall — below 40 mph indicated — Allegro is an easy lander. Short field operation capability comes from deep 48-degree flaps and good slip capability if that's still not enough. On sinky days, a long 12:1 glide will be appreciated. *** A few other basic specs include: stall with flaps extended 40 mph; cruise at 75% power is 120 mph (104 knots); climb is better than 1,000 fpm (even with the 80-hp Rotax 912 engine). 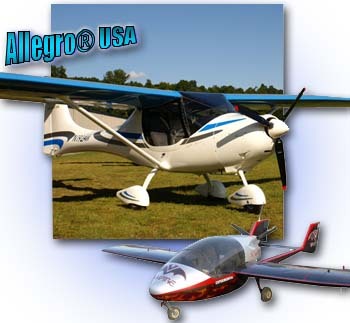 *** Allegro appears to be something of a Light-Sport Aircraft king of payload, an important factor for many shoppers. While many early LSA carried more than their empty weight, most lost that claim as their equipment lists grew more deluxe in response to customer demands. Bucking the bulking-up trend Allegro weighs a relatively trim 638 pounds with basic equipment, giving it a useful load of 682 pounds. With its smaller 17-gallon fuel tank, Allegro's payload of 536 pounds allows full fuel, two 200-pound occupants, and 34 pounds of baggage or gear. 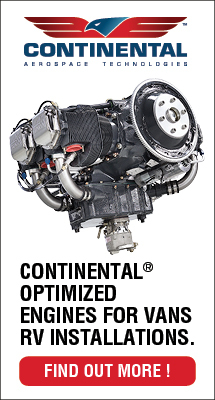 Fuel burn on the 80-hp engine can be below 3 gph in cruise at altitude. Allegro can fly 500 miles before the tanks run dry. *** Allegro's fuselage is constructed of a Kevlar-reinforced material to which are mated all-aluminum wings. The empennage structure and covering is also aluminum. This genuine composite is lean and clean helping to account for its flight efficiency. Bubble doors expand downward and aft visibility, which adds to skylight visibility. Dual throttles allow pilots to keep their arm comfortably in their lap and the center joystick is simple while easing access to either seat. *** Starting at $89,000, quite well equipped, Allegro is an American bargain you ought to consider. LSA America builds the Czech-designed Allegro in America as one of the first companies (but not the last, I suspect) to cross the Atlantic. Ironically, this results in an aircraft less expensive than other LSA that come from Eastern European countries where we once thought low wages and high aviation skills would upset U.S. airplane manufacturing. Funny how life works out, and in only six or seven years. *** Doug and Betty Hempstead, who used to import Allegro from Fantasy Air, took a long and winding road to American production finally teaming up with another developer in Roseburg, Oregon. When the other company shut down the Hempsteads had to start all over again. Finally they succeeded in bringing the Allegro to U.S. manufacturing under the company name LSA America. 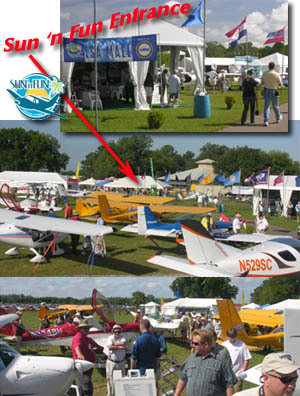 The North Carolina company was visible at Sebring 2012 where I took an opportunity to fly a Made-in-the-USA Allegro. See more Sebring photos by my European colleague, Jan Fridrich. Renegade's taildragger entry in development attracted plenty of attention. Allegro 2007 is now 100% "Made In the USA." Bristell from the Czech Republic generated good reviews from several media reporters. iTec's Maverick road-worthy powered parachute is now aided by former EAA Senior VP Bob Warner. Overseas sales have begun. The eighth running of Sebring just finished and a resounding success it was on nearly all counts. A few dour faces noted exhibitors were off a rather modest 5% (according to officials) but in every other category, smiles were broad from most attending or exhibiting at Sebring 2012. *** The weather was the best ever with temperatures hitting 80 degrees and every day was sunny and pleasant. My colleague, Jim Lawrence, presents many interesting points in his January 21 article. Here I’ll add my own views and experiences and both of us will have more in the days ahead. *** Metric #1 — Attendance set an opening day record on Thursday the 19th, surprising many, though perhaps expectations were low after the last three years of economic sluggishness. 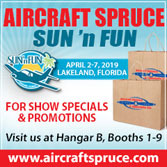 On Friday evening, airport manager Mike Willingham told me an all-time Sebring Expo record was set on the second day and judging from the thick crowds clustered around nearly every booth and filling the walkways, that was easy to believe. Allegro Keeps on Training… 3,500 Hours Logged! 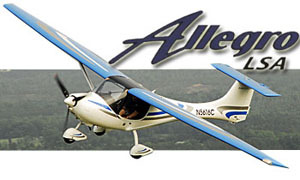 LSA America now produces the Allegro in Littleton, North Carolina and anticipates their first U.S.-produced LSA approval before Oshkosh 2011. Despite Czech-based Fantasy Air's ceasing manufacturing several years ago, Allegro did well enough in the first couple years to still retain the #14 rank. *** Exciting as this now-Made-in-the-USA story may be, this article has a different focus. I want to tell you about an older Allegro, one that has logged more than 3,500 hours, nearly all of them doing training. *** With a few other long-serving LSA that I've been told about, this addresses the matter about Light-Sports being durably built to perform instructional flying over an extended period. Some pilots believe lightly built LSA cannot handle the duress of students learning to fly. *** Allegro (N50631) appears to disprove the argument that LSA aren't tough enough. New factory operator Doug Hempstead stated, "The composite fuselage has proven itself in a flight school setting and aluminum wings make [Allegro] affordable to repair." He continued, "[Our trainer] is an Allegro 2000, the design built from 2000 to 2006." It was put in service at B Bar D Aviation Flight School with 200 hours. 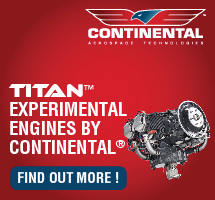 Doug said, "We now have over 3,500 hours total time and are barely 500 hours from our second engine overhaul." *** While doing some of the hardest duty in aviation he reports this particular trainer has experienced but a handful of maintenance cancellations. "We recorded only two weeks of down time in six years," stated Hempstead. "One hundred hour inspections take about eight hours and are often done overnight to avoid flight training disruptions." *** "We are logging about 90 hours a month on this aircraft and total figures for 2010 were 1,085 hours," boasted Doug. "Our peak month logged 145 hours." 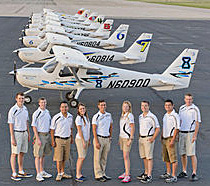 During 2010, the flight school soloed 20 people; of those 17 now have either their Sport or Private Pilot Certificates. Another student went on to earn his Sport CFI and now works for Doug and Betty Hempstead. "From our first solo in October 2005 we have soloed 84 students 11 of which now own Allegros," Doug noted. "Another 44 people have gotten their BFRs and became current again. Each of these people had lapsed flying from 2 to 15 years." *** All this yet Allegro is one of the lightest LSA. With a max takeoff weight of 1,320 pounds, empty weight is just 622 pounds on average, yielding a max useful load of 698 pounds. Since Allegro holds 17 gallons (102 pounds), payload is an impressive 596 pounds. A few other specs: stall with flaps extended 40 mph; cruise at 75% 120 mph; climb 1,000 fpm; glide 12:1. 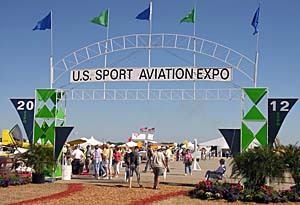 Come see the Allegro at the LSA Mall at Oshkosh 2011 or check LSA America's display in the ultralight area, space 933. 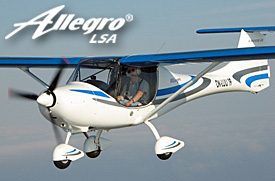 LSA America now produces the Allegro in Littleton, North Carolina and anticipates their first U.S.-produced LSA approval before Oshkosh 2011. Despite Czech-based Fantasy Air’s ceasing manufacturing several years ago, Allegro did well enough in the first couple years to still retain the #14 rank. *** Exciting as this now-Made-in-the-USA story may be, this article has a different focus. I want to tell you about an older Allegro, one that has logged more than 3,500 hours, nearly all of them doing training. *** With a few other long-serving LSA that I’ve been told about, this addresses the matter about Light-Sports being durably built to perform instructional flying over an extended period. Some pilots believe lightly built LSA cannot handle the duress of students learning to fly. *** Allegro (N50631) appears to disprove the argument that LSA aren’t tough enough. New factory operator Doug Hempstead stated, “The composite fuselage has proven itself in a flight school setting and aluminum wings make [Allegro] affordable to repair.” He continued, “[Our trainer] is an Allegro 2000, the design built from 2000 to 2006.” It was put in service at B Bar D Aviation Flight School with 200 hours. One of the early success stories in Light-Sport aviation was the Allegro. The #3 Special LSA to be approved started out so strong that even after three years of no sales following the collapse of the Czech Fantasy Air company, Allegro still holds the #14 spot on the SLSA Market Share chart. When Fantasy Air ceased manufacturing many wrote off the metal wing, composite fuselage LSA. They judged too soon. *** Importers Doug and Betty Hempstead took a hit when Fantasy Air went down, but they picked each other up, dusted themselves off, and set a plan in motion to build the Allegro in America. The first effort went south when a west coast manufacturing facility closed its doors last year. Most folks would've given up for good, but Doug and Betty are tenacious aviation entrepreneurs. A few days after Sun 'n Fun 2011, they went home and anxiously awaited a visit from the North Carolina governor. The NC Gov' came to announce cash incentives, thus the tortured Allegro story took a very positive turn. The state's One North Carolina Fund is kicking in $136,000 along with a reported $400,000 from the company. *** The headline blared: 34 jobs Flying to Halifax County; LSA America to Locate in Halifax Thanks to a State Grant. Eyewitness News 9 writer George Crocker published a story on April 6, 2011 just three days after Sun 'n Fun ended. Crocker reported,"Governor Bev Perdue announced that LSA America will build a new production facility at the Halifax-Northampton Regional Airport [creating] 34 jobs." Governor Perdue stated, "As we work to put more North Carolinians back to work we have focused on creating 21st century jobs, and that includes creating an aerospace cluster in our state with companies such as LSA America. Our efforts to expand this fast-growing industry will continue to create jobs in Halifax County and around the state." 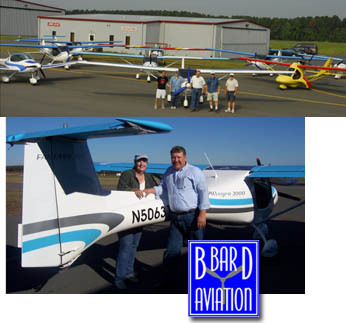 *** While declining to reveal his big news at Sun 'n Fun, Doug stated at the official ceremony, "LSA America is very pleased to establish production of its Allegro Light-Sport Aircraft in North Carolina with its rich aviation history. The incentives and dedicated people we worked with made North Carolina and Halifax County an easy choice." *** Other politicians — such as Representative Angela Bryant, of Rocky Mount NC and Senator Ed Jones, of Enfield, NC — were equally happy to celebrate new jobs coming from LSA America's plans. *** Those securing work will be happy but so will Yankee pilots who can now welcome a handsome LSA to American soil. Hempstead reported he acquired all design rights, tooling, and a considerable parts inventory. 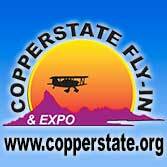 Knowledgeable Czech experts are coming soon to help establish the new operation, he said, and by summer or fall, buyers can evaluate this modestly-priced and good flying LSA in a new way... as a Made in the USA airplane. I say, give a big hand to the Hempsteads! One of the early success stories in Light-Sport aviation was the Allegro. The #3 Special LSA to be approved started out so strong that even after three years of no sales following the collapse of the Czech Fantasy Air company, Allegro still holds the #14 spot on the SLSA Market Share chart. When Fantasy Air ceased manufacturing many wrote off the metal wing, composite fuselage LSA. They judged too soon. *** Importers Doug and Betty Hempstead took a hit when Fantasy Air went down, but they picked each other up, dusted themselves off, and set a plan in motion to build the Allegro in America. The first effort went south when a west coast manufacturing facility closed its doors last year. Most folks would’ve given up for good, but Doug and Betty are tenacious aviation entrepreneurs. A few days after Sun ‘n Fun 2011, they went home and anxiously awaited a visit from the North Carolina governor. Allegro 2007 is back! This modestly-priced LSA -- the third ever approved, back in May 2005 -- is returning to market from a company associated with Sadler Aircraft and its Vampire (lower photo). Until the new model is available you can read my earlier Allegro pilot report. Some have likely forgotten that the Allegro was the third Special Light-Sport Aircraft ever certified, following only Evektor's SportStar and Flight Design's CT. It was also a market leader early on...in fact, it did so well, Fantasy Air (the now-bankrupt Czech designer and producer) still holds the #12 position even without a sale in nearly two years. *** The founding company's troubled history is now being replaced with an all-American manufacturing effort based on the revised Allegro 2007 model that saw improvements to better suit the American market. Allegro USA LLC, the newly-formed company, announced in June that Allegro will now be built completely in Roseburg, Oregon. Allegro USA believes this will eliminate concerns for warranty, parts, delivery, and financing. *** Some LSA suppliers may be cautious in today's economy but Allegro USA is taking strides to regain its market position. 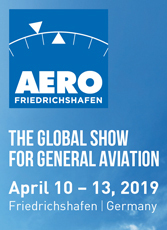 "We believe in the Allegro and the American LSA market, and will continue with our expansion of the Allegro for the United States market and beyond," stated Doug Hempstead, president of Allegro USA LLC. "It has never been easier, nor a better time to own a new Allegro light sport aircraft than right now." The company has not announced prices yet nor is its website up. But the reasonably-priced, now all-American Allegro is returning to marketplace and for cash-strapped American pilots, that seems like good news. Some have likely forgotten that the Allegro was the third Special Light-Sport Aircraft ever certified, following only Evektor’s SportStar and Flight Design’s CT. It was also a market leader early on…in fact, it did so well, Fantasy Air (the now-bankrupt Czech designer and producer) still holds the #12 position even without a sale in nearly two years. *** The founding company’s troubled history is now being replaced with an all-American manufacturing effort based on the revised Allegro 2007 model that saw improvements to better suit the American market. Allegro USA LLC, the newly-formed company, announced in June that Allegro will now be built completely in Roseburg, Oregon. Allegro USA believes this will eliminate concerns for warranty, parts, delivery, and financing. *** Some LSA suppliers may be cautious in today’s economy but Allegro USA is taking strides to regain its market position. 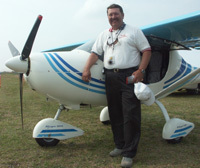 Fantasy Air USA VP Doug Hempstead poses with his Allegro 2000 that just won FAA's third approval as a Special Light-Sport Aircraft. 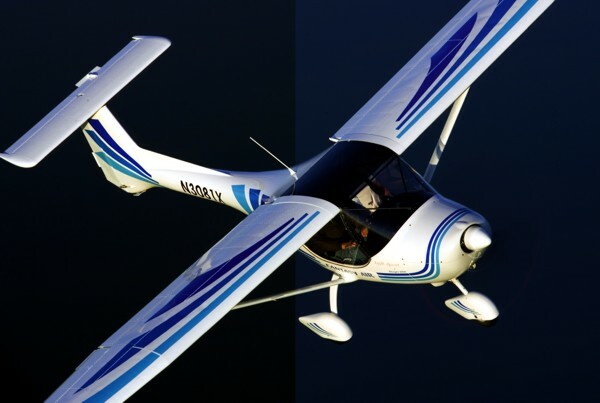 In only the third approval under the new Sport Pilot rule, B Bar D Aviation and Fantasy Air USA announced news that their Allegro 2000 has received its certification as a Special Light-Sport Aircraft. Allegro 2000 has been warmly received and Fantasy Air USA can now begin deliveries of ready-to-fly aircraft to customers that have placed orders. See my review in Ultralight Flying! 's 5/05 issue -- the article will post here soon. SPLOG will report two more certifications in the near future. 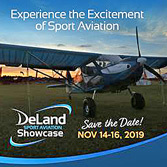 In only the third approval under the new Sport Pilot rule, B Bar D Aviation and Fantasy Air USA announced news that their Allegro 2000 has received its certification as a Special Light-Sport Aircraft. Allegro 2000 has been warmly received and Fantasy Air USA can now begin deliveries of ready-to-fly aircraft to customers that have placed orders. See my review in Ultralight Flying!’s 5/05 issue — the article will post here soon. SPLOG will report two more certifications in the near future. In general, most pilots will agree the Allegro exhibits great performance. The Allegro features two-position flaps, with the switch located just forward of the brake handle of the center-mounted stick. Customers may outfit their panel to their choosing with a combination of electronic or traditional steam gauge instruments/navigation aids. 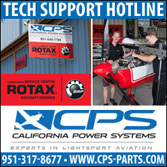 The aircraft's standard powerplant is the 80-hp Rotax 912 engine. The Allegro is the value leader among LSA designs. One year ago, the fi rst special light-sport aircraft (S-LSA) were approved and delivery of S-LSA began. A few brands stand above the rest in the number of aircraft delivered. One of those is the Allegro 2000, imported into the United States from the Czech Republic by Fantasy Air USA. Since May 19, 2005, when the Allegro earned S-LSA approval, Fantasy Air has delivered more than 40 aircraft, keeping owners Doug and Betty Hempstead busy. One of the appealing factors of the Allegro 2000 is its price, which starts in the upper $50,000 range for the flyaway version. An airplane with an attractive price has a clear advantage over others with higher price tags. When that airplane flies well, is supported well, and has the equipment desired by consumers, it's likely to succeed. Well-Established Given its fast start, Fantasy Air USA has reason for optimism, but the Allegro design has a much longer history outside this country. The Allegro series of aircraft has been flying for a dozen years in Europe. 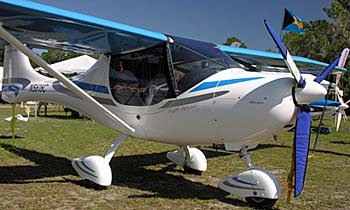 Fantasy Air s.r.o., the parent company, reports more than 450 units flying throughout the world. Located on the Sanford-Lee County Regional Airport in Sanford, North Carolina, Fantasy Air USA is developing its facility to become the manufacturing home for the Allegro 2000 in the United States. Currently, it is assembling the aircraft in stages with imported parts. Later, it hopes to fabricate more parts in the United States. 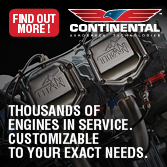 Either way, Fantasy Air can assure buyers it will have readily available replacement parts. In addition, Fantasy Air offers all airframe services, plus warranty work, and the company operates a flight school that provides pilot training tailored to the Allegro 2000. It has a network of 11 dealers to sell and service the Allegro throughout the United States. 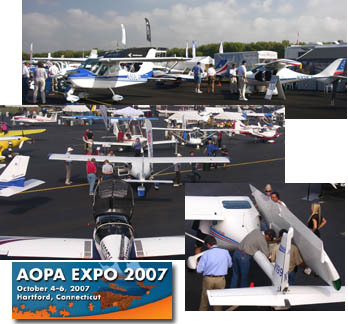 When EAA took its Sport Pilot Tour to the Phoenix area in February 2006, a first occurred-a flight school on the fi eld, Falcon Executive Aviation, offers sport pilot training, and its aircraft of choice is the Allegro 2000. (See sidebar "Instructing With the Allegro.") But, while Fantasy Air's focus is on delivering ready-to-fly Allegros for private owners, flight schools, and rental facilities, it also offers the aircraft as an experimental amateur-built aircraft with a quickbuild kit. Modern Materials; Modern Cockpit The Allegro's fuselage is constructed of a Kevlar-reinforced composite material to which are mated aluminum wings. On earlier models, the wing area aft of the leading edge D-cell was fabric, but this has given way to full aluminum wings. The empennage structure and covering is also aluminum. Although the Allegro is leaner looking than some S-LSA on the market, it has a generous interior size. A tad more than 43 inches wide at the shoulders, it is nearly 4 inches wider than a Cessna 172 and an inch wider than a Cessna 182. However, I found entry into the Allegro a bit challenging. The highwing aircraft's doors open upward, but the entry space is small because the aircraft's cabin floor is high. Consequently, you must bend to get yourself inside. 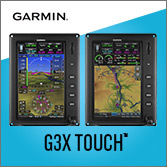 Luckily, the aircraft has a center-mounted joystick, which keeps the interior space free of obstacles during entry. The Allegro's door latch works well; a rod slides up and down a slotted bracket and slips into a keyhole at the top of the slot to prop the door open. To lower the door, you manually pull the rod toward the inside of the plane while pulling down on the door handle. Once closed, a twist of a lever inserts a different rod on the front side of the door. This saves the weight of gas pistons, which are common in many LSA. Once the door is secured, the view is broad; the doors are full Lexan panels, and there's a large overhead skylight and a wide windshield that angles down to meet the doors. For open-cockpit enthusiasts like me, you can fly with the doors open up to 80 mph-perfect if you want to do aerial photography. The factory can also provide a sliding window in the door. If you enjoy wind moving through the cabin, removing the doors entirely is a process that "takes about three minutes," said Doug Hempstead. Many pilots are enamored of open-cockpit flying. The Allegro's joystick is centered between the side-by-side seats. Most right-handed pilots will fi nd it natural if seated in the left seat; from the right seat, some may fi nd its operation awkward. I thought the center joystick worked quite well. (I was seated on the left and am right-handed.) The control was fluid and produced a good response to movement ratio. But the Allegro does have two throttles, a feature flight instructors will like. A hand brake is mounted on the front side of the joystick. Thanks to the authority offered via hydraulic action, your hand can adequately apply enough brake pressure to stop the airplane. The Allegro's seats adjust up and down plus fore and aft via a strap arrangement that is advisably changed on the ground; you can adjust the seats in flight, but you'd need to be pretty flexible to do it. The up and down adjustment range is about 4 inches, and fore/aft adjustment is about 6 inches. The design's fi rm, molded seats support you well with good lumbar support, most uncommon in airplane seats. Because the seats adjust, no rudder pedal adjustment is planned. A two-position flap switch, located just forward of the joystick, moves the flaps to 15 degrees for normal takeoffs and landings or to a deep 48 degrees for short-fi eld operations. When retracted, the flaps go slightly negative (about 5 degrees) in the tradition of sailplanes, which use negative reflex-or a slight upward curving of the trailing edge-as a performance enhancement. When the flaps are being extended, an LED flashes red. It turns green when the flaps reach any selected position. It's quite simple but may not appeal to those who like to tweak their flap positions more subtly. Full flaps cannot be used until the airspeed is 70 mph or less. The instrument panel has a modern yet practical design with well-placed flight and engine instruments. The panel's relatively low height allows good forward visibility while taxiing. A small horizontal shelf in the panel provides a place to stash maps temporarily. Another small storage area is located under each seat, but you can't access these areas during flight. A larger luggage area located behind the seats has a lot of cubic space, but it's limited to 33 pounds. For most flights in the Allegro, this area will suffi ce. But getting large items in this space may prove a little challenging because the adjustable seat straps are in the way. The Allegro 2000 holds 14.5 gallons of fuel, giving the airplane an endurance range of about three hours (somewhat more in economy cruise). A professional fuel fi ll cap is located just below the lower edge of the left-side door. As a design innovation, the Allegro's engineers positioned the fuel tank under the floor and ran all fuel lines under the floor structure or forward of the fi rewall. They implied this could be an improved safety factor in certain types of incidents. What I noticed was that this installation kept fuel fumes from entering the cockpit. Twin 6-gallon auxiliary wing tanks are an option, giving a total of 26.5 gallons on board. This added fuel extends the airplane's range to more than fi ve hours. "The Allegro 2000 was designed for a maximum takeoff weight of 1,232 pounds," Doug Hempstead said. (That was the original weight proposed for LSA.) Given its empty weight of about 622 pounds (depending on optional equipment chosen), the Allegro can claim a useful load of 610 pounds. Subtracting 87 pounds for the standard 14.5 gallons of fuel, the remaining payload is an impressive 523 pounds. Even with the optional long-range tanks, the Allegro 2000 has a 451-pound payload. This equates to a full 33 pounds of cargo and two 209-pound occupants, even with fi ve hours of fuel on board. Up We Go The Allegro 2000 wants to fly. I added in full power and rotated at about 50 mph, though slightly faster might be advised to assure you remain well above the airplane's 40 mph stall speed. The Allegro's takeoff run, at about 500 feet, is a little longer than the average LSA; this may be a function of its long, tapered wing that likes to glide. The Allegro has large ailerons that demonstrate strong control authority within reasonable crosswind angle and wind speed limits. Thanks to those large ailerons and the Allegro's equally strong rudder, you can hold a good sideslip to landing, though you may never need to do so, given the deep flap setting available. However, again, you can't lower the flaps until you've slowed to about 70 mph. With flaps at the first notch, deployment will be 15 degrees. At this setting you can approach comfortably while carrying 65 mph, a speed that will allow operations at most shorter strips. Once experienced in the Allegro, you can use full flaps and approach at perhaps 50 mph to make the shortest fi elds. But the round-out at this speed comes rather abruptly, given the heavy drag of full flaps. In my trials, I settled on about 55 mph and the first notch of flaps, though that may be slightly slower than optimal. In the event you need to extend your approach, flying at about 65 mph with no flaps will use the design's solid glide performance. Running the Allegro through its handling paces, I found a roll rate of about three seconds for 45- to 45- degree bank changes. Though quite responsive, this is about average for the LSA I've flown. However, with the Allegro I found it was harder than average to keep the ball in the center of the lip/skid tube. Responsive controls suggest the plane will be useful for training, yet it should satisfy most recreational fliers. While in turns, especially to your opposite side, visibility is enhanced by the overhead skylight and the low instrument panel. However, the curved-top panel does take away a familiar reference line for holding turns steady. In general, most pilots will agree the Allegro exhibits great performance. 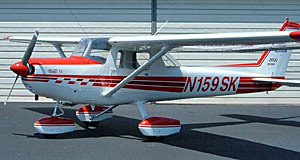 Its glide ratio is reported as 12-to- 1; that's substantially better than most general aviation aircraft or ultralights. Perhaps this long reach is no surprise given the more than 35-foot wing on the Allegro 2000; many LSA use wingspans in the 28- to 30-foot range. The Czech design uses a dualtapered wing in the outboard wing section, which allows the long wing to have large ailerons without sacrificing flap area. With 122 square feet of wing area, the Allegro is loaded to 10 pounds per square foot, so it handles bumpy air with less rocking and rolling than most lightly loaded aircraft. Always in Control The Allegro's VNE (never exceed speed) is set at 137 mph, which is just shy of the maximum speed allowed for LSA (120 knots or 138 mph). That gives the aircraft a normal cruise speed of about 115 mph. I commonly seek a power setting to keep noise and vibration at a minimum for creature comfort (mine!). By feel, I liked about 5200 rpm on the Allegro I flew, which produced 110-115 mph-safely below Allegro's VNE, but still fast enough for touring. If you want to stretch your fuel supply, you can ease back to 4800 rpm where consumption will drop to about 3.5 gph and speed will hold at about 105 mph. That 400 rpm difference also turns out to be easier on your ears. The Allegro's airspeed indicator was marked for a 45 mph stall in the landing confi guration (bottom of the white arc). A wide yellow arc, from 90 mph to VNE, cautions against flying in the upper ranges. Keeping the Allegro within its speed limits will prove straightforward with the 80-hp Rotax 912, but those electing the 100-hp model may have to watch power dives. While running through my common routine of stalls, I found some signifi cant buffeting and stick movement preceded stall break. When stalls break in an Allegro 2000, one wing tended to drop, but not with great suddenness. Normal stall recovery easily returned the plane to level flight with little altitude loss. Stalls done at cruise power (approximately 75 percent) were more attention-getting and had less warning; the nose can drop noticeably. But the extreme deck angle you reach before stall should be all the warning you need that a stall is imminent. The factory does not approve spins, so I didn't try them. This Allegro was not fi tted with a parachute, though the company does offer the option if a customer wishes. Spend Less, Fly More The Allegro 2000 in ready-to-fly form powered by the 80-hp Rotax 912 engine and a three-blade WoodComp propeller is currently listed at $57,225. The Allegro 2000 with the 100-hp Rotax 912S is listed at $59,850. Because the airplane is imported, the euro currency exchange rates can affect this fi gure; check with Fantasy Air for the latest prices. Neither of these models is stripped down. At only a shade more than most completed kits, this ready-to-fly beauty comes wellloaded, including airspeed indicator, altimeter, vertical speed indicator, bank indicator, compass, fuel level gauge, flap position indicator, tachometer, water temperature, oil temperature, oil pressure, fuel pressure, ELT, hydraulic disc brakes on main wheels, electrical flaps, upholstered and carpeted cockpit, color design choice, and electric fuel pump and fuel drain valve. At these prices and with these options, the Allegro is the value leader among LSA designs. It is no wonder the company has enjoyed brisk sales. Fantasy Air's success at selling the aircraft to some conventional GA flight schools is further proof of the aircraft's ramp appeal as well as good performance and economy. Though the Allegro leads the fi eld from a value standpoint, $57,000 to $59,000 may still be out of reach for some potential buyers. Plus, homebuilders enjoy the experience of assembly. So, unlike many LSA suppliers (especially importers), Fantasy Air offers an even lower cost option with the Allegro 2000 in kit form. You can purchase a quick-build kit (QBK) for only $26,125, plus freight. Build time to assemble the aircraft is reportedly about 190 hours. The QBK is a partially assembled airframe with the majority of the work fi nished for you. Completely riveted aluminum wings, wing struts, elevator, and rudder are included. Fantasy Air's QBK contains all electric flap control parts, the engine cowling, pre-assembled front nosewheel assembly, and completed main gear legs. The fuselage comes fully welded using factory jigging and tooling. The wing connects, elevator, and main gear legs are already fi tted, and all structural parts (wing, elevator, and main undercarriage fi ttings) are installed on the airframe. 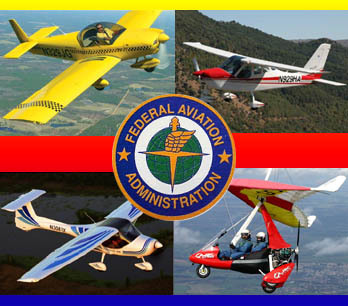 A scratch builder won't need all this help and might look elsewhere for a more ambitious project, but most folks primarily looking to reduce their cost will benefi t from all the work Fantasy Air does legally under experimental LSA (E-LSA) regulations. The company said the homebuilder's main task is assembling and installing the steering components into the airframe. It is also necessary to install the nose wheel, some cabin parts, wingtips, and elevator. To the QBK price you must add powerplant and propeller, instruments, and paint. Taking a base kit cost of about $28,000 with shipping, adding an 80-hp 912 engine and engine mount kit plus prop (about $15,000), instruments (assuming $5,000 worth), and fi nishing costs (about $2,000), you will have invested about $50,000 plus a couple hundred hours of your time. Obviously, it's your choice between your time and labor or the extra $7,000 to have a ready-to-fly airplane. Either way, you'll spend literally tens of thousands of dollars less than for other LSA. You cannot compare LSA by price alone, but no matter how you stack up the numbers and factor in the flight qualities of the Allegro, you'll come up with a competitive airplane that should find a market for a long time. Wing loading 9.4 pounds/square ft.
2 Two 6-gallon auxiliary tanks available. The Allegro is the value leader among LSA designs. One year ago, the fi rst special light-sport aircraft (S-LSA) were approved and delivery of S-LSA began. A few brands stand above the rest in the number of aircraft delivered. One of those is the Allegro 2000, imported into the United States from the Czech Republic by Fantasy Air USA. Since May 19, 2005, when the Allegro earned S-LSA approval, Fantasy Air has delivered more than 40 aircraft, keeping owners Doug and Betty Hempstead busy. One of the appealing factors of the Allegro 2000 is its price, which starts in the upper $50,000 range for the flyaway version. An airplane with an attractive price has a clear advantage over others with higher price tags. When that airplane flies well, is supported well, and has the equipment desired by consumers, it’s likely to succeed. Well-Established Given its fast start, Fantasy Air USA has reason for optimism, but the Allegro design has a much longer history outside this country. Falcon Executive Aviation in Mesa, Arizona, enjoys a thriving business teaching private, commercial, and instrument students with Cessna and Piper aircraft. But Falcon Executive decided to take a chance. After careful consideration, this Arizona fi xed-base operator (FBO) chose to add a light-sport aircraft to its inventory. Vic Hannig, Falcon's sales manager, and a friend, Larry Vaughan, researched the LSA fi eld and selected the Allegro as an excellent value. How successful was this decision? When EAA held a Sport Pilot Tour at Falcon Field last February, EAA's Ron Wagner and I visited with Vic and his chief fl ight instructor, Matt Miller. Vic left no doubt in our minds that their decision to embrace sport pilot training was a good one. When asked if the Allegro was robbing business from the Cessna and Piper fl eet-that is, were hours fl own in the Allegro merely replacing hours that would have been fl own in the Cessna or Piper aircraft-Vic said, "No. It's new money." The words "new money" were magical. It was exactly what we wanted to hear. LSA are much more likely to prosper in fl ight schools if they do not displace activity on other aircraft. Schools have major investments in their GA fl eets and can't ignore them. That a major FBO like Falcon Executive can profi tably use the Allegro without harming its existing business means it can be (and is!) satisfi ed with its LSA purchase and will perhaps look to add more LSA. Vic said Falcon Executive's Allegro fl ies 70-80 hours a month, a fi gure Falcon considers competitive and justifying of its purchase. 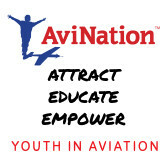 Falcon Executive Aviation in Mesa, Arizona, enjoys a thriving business teaching private, commercial, and instrument students with Cessna and Piper aircraft. But Falcon Executive decided to take a chance. After careful consideration, this Arizona fi xed-base operator (FBO) chose to add a light-sport aircraft to its inventory. Vic Hannig, Falcon’s sales manager, and a friend, Larry Vaughan, researched the LSA fi eld and selected the Allegro as an excellent value. How successful was this decision? When EAA held a Sport Pilot Tour at Falcon Field last February, EAA’s Ron Wagner and I visited with Vic and his chief fl ight instructor, Matt Miller. Vic left no doubt in our minds that their decision to embrace sport pilot training was a good one. When asked if the Allegro was robbing business from the Cessna and Piper fl eet-that is, were hours fl own in the Allegro merely replacing hours that would have been fl own in the Cessna or Piper aircraft-Vic said, “No.